Ideal for high-seismic areas, Simpson Strong-Tie® SC connectors are the optimal solution for slide-clip bypass framing. SC clips are often welded to the structure in high-seismic zones, but they also feature anchorage holes so that concrete screws or powder-actuated fasteners can be used to attach the clip to the structure. In addition to anchorage versatility, the SC clips include "No-Equal" stamps at the center of the slots to ensure proper shouldered screw placement. SC connectors are manufactured using heavy-duty 10- and 12-gauge steel to provide exceptional resistance to in-plane seismic load. 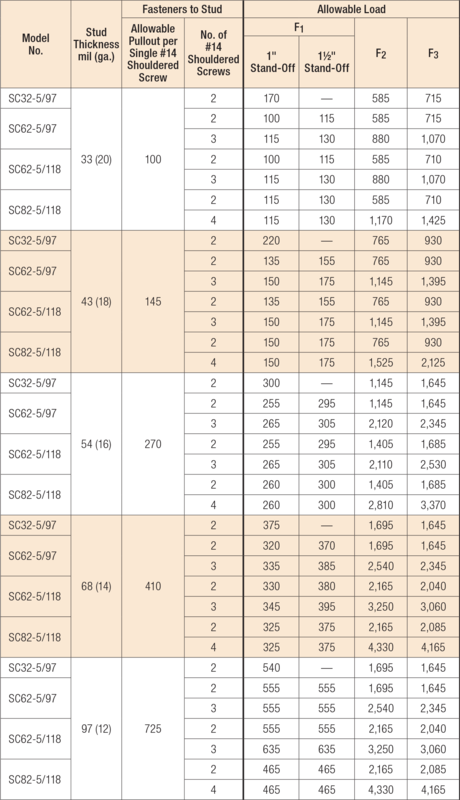 Use the specified number of XLSH78B1414 #14 shouldered screws (included). Install the screws in the slots adjacent to the "No-Equal" stamps. Use one shouldered screw per slot (maximum). A submittal/substitution request for the SC bypass framing slide-clip connector for cold-formed steel construction. Each box contains (25) connectors and enough shouldered screws for installation. Replacement #14 shouldered screws for SC connectors are XLSH78B1414-RP83. SC Allowable Connector Loads are also limited by the SC Anchorage Load tables below. Use the minimum tabulated values from the connector and anchorage load tables as applicable. See illustration for fastener placement when using only two shouldered screws to the stud. Tabulated F1 loads are based on assembly tests with the load through the centerline of stud.Tested failure modes were due to screw pullout; therefore compare F1 against FP calculated per ASCE 7-10 Chapter 13 with aP=1.25 and Rp=1.0. F1 loads are based on maximum stand-off distances of 1" or 1 1/2" as shown. Other loads are applicable to a 1" stand-off for SC32 and 1" or 1 1/2" stand-off for SC62 and SC82. At the bend line, the gross allowable plastic moment in the F1 load direction for 97 mil (12 ga.) and 118 mil (10 ga.) SC connectors are 395 in.-lb. and 675 in.-lb., respectively. At a vertical slot, the net allowable plastic moment in the F1 load direction for 97 mil (12 ga.) and 118 mil (10 ga.) SC connectors are 260 in.-lb. and 440 in.-lb., respectively. Allowable anchorage loads are also limited by the SC Connector Load Table above. Use the minimum tabulated values from the connector and anchorage load tables as applicable. Allowable loads for #12-24 self-drilling screws and PDPAT powder-actuated fasteners are based on installation in minimum 3/16" thick structural steel with Fy = 36 ksi. PDPAT values are also provided for A572 steel. 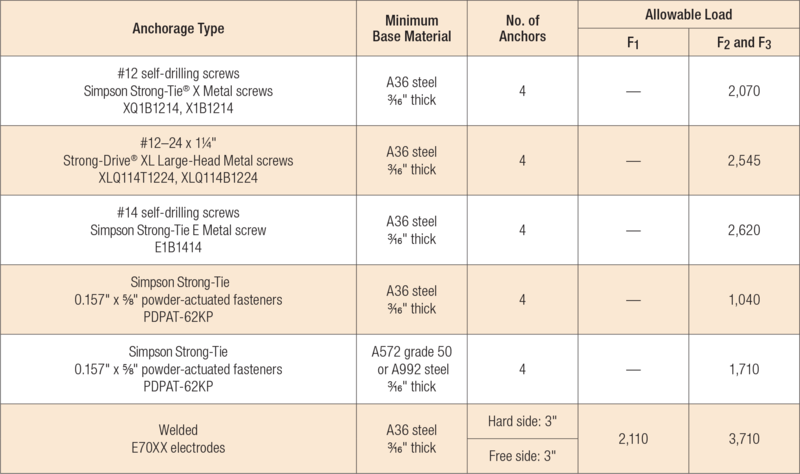 Values listed above may be used where other thicknesses of steel are encountered provided that the fastener has equal or better tested values into thicker steel. It is the responsibility of the Designer to select the proper length fasteners based on the steel thickness installation. Allowable anchor capacities have been determined using ACI 318-14 Chapter 17 calculations with a minimum concrete compressive strength (f'c) of 3,000 and 4,000 psi in normal-weight concrete. Tabulated values shall be multiplied by a factor (λa) of 0.6 for sand light-weight concrete. Tabulated allowable loads are based on anchorage only. The capacity of the connection system shall be the minimum of the allowable anchorage load and the SC Allowable Connector Loads. SC32-5/97 No evaluation report listing. SC62-5/118 No evaluation report listing. SC62-5/97 No evaluation report listing. SC82-5/118 No evaluation report listing.